I grew up on boeuf bourguignon, we could be guaranteed to have it at least once a month during the winter. Since a braised dish like this is better a day or two after it’s cooked, my mom would usually make it on a Sunday, and it would sit on the chilly garage floor in her big orange Le Creuset Dutch oven until dinnertime on Tuesday. I remember being very small, and being tasked with bringing the stew upstairs, I swear that cast iron pot weighed more than I did, and it was so cold it burned. Since a bottle of wine goes into a boeuf bourguignon, and even after a long braise not all of the alcohol cooks off, I’m wondering if this dish didn’t contribute to some of excellent sleeping we got done as kids. The recipe starts with some home butchery, getting beef shoulder off the bone, and cubed. The cubes are then seasoned, coated in flour, and thoroughly browned. The meat then braises for an afternoon with sweated onions, garlic, and carrots, tomatoes, red wine, and a bouquet garni. While that’s going on you get to blanch and peel boiling onions. I hate peeling boiling onions, but I did it anyway. The onions then get browned with some butter, and simmered until tender. You then sauté some mushrooms in butter, and add the mushrooms and onions to the braise, and let it simmer for a few minutes. Once everything’s done cooking you can eat it right away, or better yet stick in in the back of the fridge and forget about it for a couple of days. 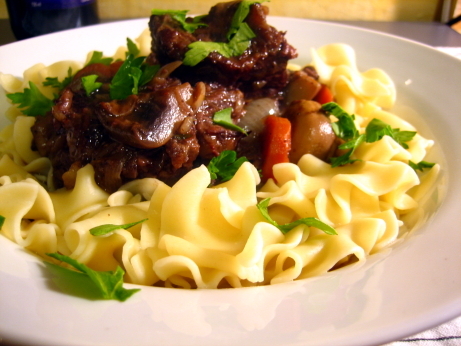 The Book recommends serving this dish with buttered potatoes, but I’ve always been a fan of egg noodles with boeuf bourguignon, so that’s what we had. There’s an error in this recipe. The first ingredient listed is a quarter pound of bacon, and the fist cooking direction is to simmer the bacon in water for a few minutes. That bacon is never mentioned again. The linked Epicurious recipe has the error fixed, you’re supposed to crisp up the bacon in the pot before starting the braise, but it’s mystery bacon if you follow The Books version. I guessed that it was meant to go into the braise, and that worked out well, but I hope they’ve caught this mistake in the updated version of The Book. I was entirely satisfied with this dish, it tastes just like what mom used to make, it’s hearty, rich, stick to your ribs, winter cooking. The flavours were right on, this is not a difficult dish to get close to right, but making it really well is a challenge. This is a really solid boeuf bourguignon recipe, my only complaint is that it was a bit too salty. I’ll certainly be making this one again next winter. i am very interested in trying the beef bourgignon recipe but am unable to locate the link to it. Hi Carol, The link is at the top of the post, under the photo where it says “the recipe”. KC, that link currently points to a “page not found.” It’s probably supposed to link to one of the other epicurious recipes for Beef Bourguignon. OK, link fixed. It now points to the particular recipe. Can Beef Bourguignon be made without bacon and are there any good non pork substitutes? Please post if so, I too am interested to know if this can be made without pork. You can skip the bacon. What a good recipe, east to understand directions, very easy to create as well as very great tasting, all the family liked it, appreciate it so much. The bacon can be put to much better use than you have here. I always cook the bacon lardons down first thing, then use the rendered fat to cook the onions and mushrooms. I don’t add the crisp bacon to the braise but use it as a garnish to add a crunchy texture to the final dish.